Optic atrophy is the final common morphologic endpoint of any disease process that causes axon degeneration in the retinogeniculate pathway. Clinically, optic atrophy manifests as changes in the color and the structure of the optic disc (cupping) associated with variable degrees of visual dysfunction. The term "atrophy" is a misnomer, since, in its strict histologic definition, atrophy implies involution of a structure due to prolonged disuse. The optic nerve comprises approximately 1.2 million axons that originate at the ganglion cell layer of the retina. The axons of the optic nerve are heavily myelinated by oligodendrocytes, and the axons, once damaged, do not regenerate. Thus, the optic nerve behaves more like a white matter tract rather than a true peripheral nerve. The average optic nerve head is 1 mm deep, 1.5 mm wide, 1.8 mm high at the retinal level, and a little wider posteriorly. The optic nerve head sits at a major transition between an area of high pressure to an area of low pressure (intracranial pressure) and is composed of 4 types of cells: ganglion cell axons, astrocytes, capillary-associated cells, and fibroblasts. Light incident from the ophthalmoscope undergoes total internal reflection through the axonal fibers, and subsequent reflection from the capillaries on the disc surface gives rise to the characteristic yellow-pink color of a healthy optic disc. Degenerated axons lose this optical property, explaining the pallor in optic atrophy. The blood supply at the optic nerve head is provided by pial capillaries arising from the circle of Zinn-Haller. These capillaries exhibit autoregulation and are not leaky. Alternatively, the loss of these capillaries leads to a pale-appearing disc. The Kestenbaum capillary number index is the number of capillaries observed on the optic disc. The normal count is approximately 10. In optic atrophy, the number of these capillaries reduces to less than 6, while more than 12 suggests a hyperemic disc. Optic atrophy is classified as pathologic, ophthalmoscopic, or etiologic. Degeneration begins in the retina and proceeds toward the lateral geniculate body (eg, toxic retinopathy, chronic simple glaucoma). Larger axons disintegrate more rapidly than smaller axons. Degeneration starts from the proximal portion of the axon and proceeds toward the optic disc (eg, optic nerve compression via intracranial tumor). In trans-synaptic degeneration, a neuron on one side of a synapse degenerates as a consequence of the loss of a neuron on the other side (eg, in individuals with occipital damage incurred either in utero or during early infancy). In conditions with primary optic atrophy (eg, pituitary tumor, optic nerve tumor, traumatic optic neuropathy, multiple sclerosis), optic nerve fibers degenerate in an orderly manner and are replaced by columns of glial cells without alteration in the architecture of the optic nerve head. The disc is chalky white and sharply demarcated, and the retinal vessels are normal. Lamina cribrosa is well defined. In conditions with secondary optic atrophy (eg, papilledema, papillitis), the atrophy is secondary to papilledema (shown in the image below). Optic nerve fibers exhibit marked degeneration, with excessive proliferation of glial tissue. The architecture is lost, resulting in indistinct margins. The disc is grey or dirty grey, the margins are poorly defined, and the lamina cribrosa is obscured due to proliferating fibroglial tissue. Hyaline bodies (corpora amylacea) or drusen may be observed. Peripapillary sheathing of arteries as well as tortuous veins may be observed. On visual fields, progressive contraction of visual fields may be seen. Optic atrophy following papilledema (secondary). In consecutive optic atrophy (eg, retinitis pigmentosa, myopia, central retinal artery occlusion), the disc is waxy pale with a normal disc margin, marked attenuation of arteries, and a normal physiologic cup. 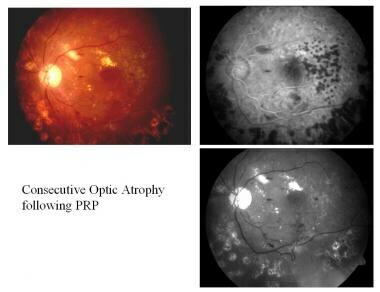 Consecutive optic atrophy following panretinal photocoagulation (PRP). 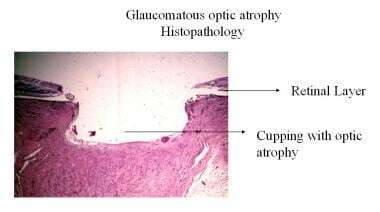 Also known as cavernous optic atrophy, marked cupping of the disc is observed in glaucomatous optic atrophy. Characteristics include vertical enlargement of cup, visibility of the laminar pores (laminar dot sign), backward bowing of the lamina cribrosa, bayoneting and nasal shifting of the retinal vessels, and peripapillary halo and atrophy. Splinter hemorrhage at the disc margin may be observed. Temporal pallor may be observed in traumatic or nutritional optic neuropathy, and it is most commonly seen in patients with multiple sclerosis, particularly in those with a history of optic neuritis. The disc is pale with a clear, demarcated margin and normal vessels, and the physiologic pallor temporally is more distinctly pale. This is divided into congenital or infantile optic atrophy (recessive or dominant form), Behr hereditary optic atrophy (autosomal recessive), and Leber optic atrophy. [1, 2] Several hereditary optic neuropathies, including optic atrophy type 1 and Leber optic atrophy, have been attributed to mitochondrial dysfunction in retinal ganglion cells. Autosomal-dominant optic atrophy type 1 is caused by mutations in the OPA1 gene on chromosome 3q29. The OPA1 protein produced plays a key role in a process called oxidative phosphorylation and in self-destruction of cells (apoptosis). OPA1 is an integral pro-fusion protein within the internal mitochondrial membrane. Mutations in the OPA1 gene lead to vision problems experienced by people with breakdown of structures that transmit visual information from the eyes to the brain. Affected individuals first experience a progressive loss of nerve cells within the retina, called retinal ganglion cells. The loss of these cells is followed by the degeneration (atrophy) of the optic nerve. X-linked optic atrophy type 2 is caused by mutation in the OPA2 gene with cytogenetic location Xp11.4-p11.21. The patient presents with early-onset childhood vision loss with slow progression of loss. Hereditary optic atrophy type 3 is caused by mutation in the OPA3 gene with cytogenetic location 19q13.32. The mutation in this gene is associated with childhood-onset vision loss with cataract. It can also be associated with type III methylglutaconic aciduria. Leber hereditary optic neuropathy results from mitochondrial point mutations in mtDNA 11778G>A, 14484T>C, or 3460G>A mutations. 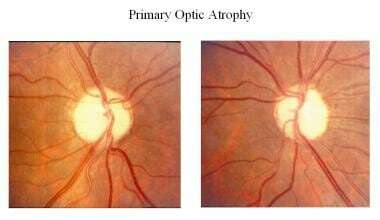 Consecutive atrophy is an ascending type of atrophy (eg, chorioretinitis, pigmentary retinal dystrophy, cerebromacular degeneration) that usually follows diseases of the choroid or the retina. Circulatory is an ischemic optic neuropathy observed when the perfusion pressure of the ciliary body falls below the intraocular pressure. Circulatory atrophy is observed in central retinal artery occlusion, carotid artery occlusion, and cranial arteritis. It is observed in disorders such as thyroid ophthalmopathy, juvenile diabetes mellitus, nutritional amblyopia, toxic amblyopia, tobacco, methyl alcohol, and drugs (eg, ethambutol, sulphonamides). It is observed in diseases such as multiple sclerosis and Devic disease. It is observed in diseases such as glaucoma and papilledema. It is observed in diseases such as optic neuritis, perineuritis secondary to inflammation of the meninges, and sinus and orbital cellulites. 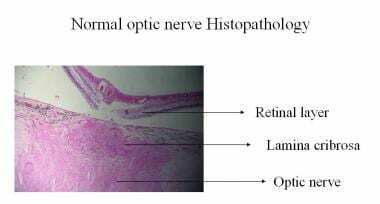 The exact pathophysiology of traumatic optic neuropathy is poorly understood, although optic nerve avulsion and transection, optic nerve sheath hematoma, and optic nerve impingement from a penetrating foreign body or bony fragment all reflect traumatic forms of optic nerve dysfunction that can lead to optic atrophy. Regardless of etiology, optic atrophy is associated with variable degrees of visual dysfunction, which may be detected by one or all of the optic nerve function tests (see Other Tests). Radiation optic neuropathy more frequently occurs with radiation doses of at least 5,000 centigray. It may be result from radiation damage to the optic nerve vasculature or the optic nerve parenchyma itself. Optic atrophy is not a disease but a sign of many disease processes. Thus, morbidity and mortality in optic atrophy depends on the etiology. Optic atrophy is more prevalent in African Americans (0.3%) than in whites (0.05%). There is no sexual predisposition noted. Optic atrophy is seen in any age group. Early and intensive treatment in nutritional optic neuropathy can provide patients with near-normal vision. Lenaers G, Hamel CP, Delettre C, Amati-Bonneau P, Procaccio V, Bonneau D, et al. Dominant optic atrophy. Orphanet J Rare Dis. 2012 Jul 9. 7(1):46. [Medline]. Nakaso K, Adachi Y, Fusayasu E, Doi K, Imamura K, Yasui K, et al. Leber's Hereditary Optic Neuropathy with Olivocerebellar Degeneration due to G11778A and T3394C Mutations in the Mitochondrial DNA. J Clin Neurol. 2012 Sep. 8(3):230-4. [Medline]. [Full Text]. Tielsch JM, Javitt JC, Coleman A, et al. The prevalence of blindness and visual impairment among nursing home residents in Baltimore. N Engl J Med. 1995 May 4. 332(18):1205-9. [Medline]. Munoz B, West SK, Rubin GS, et al. Causes of blindness and visual impairment in a population of older Americans: The Salisbury Eye Evaluation Study. Arch Ophthalmol. 2000 Jun. 118(6):819-25. [Medline]. Gueven N. Idebenone for Leber's hereditary optic neuropathy. Drugs Today (Barc). 2016. 52(3):173-81. [Medline]. [Full Text]. Klopstock T, Yu-Wai-Man P, Dimitriadis K, et al. A randomized placebo-controlled trial of idebenone in Leber's hereditary optic neuropathy. Brain. 2011 Sep. 134:2677-86. [Medline]. [Full Text]. Lopez Sanchez MI, Crowston JG, Mackey DA, Trounce IA. Emerging Mitochondrial Therapeutic Targets in Optic Neuropathies. Pharmacol Ther. 2016. Sep 165:132-52. [Medline]. [Full Text]. de Lima S, Koriyama Y, Kurimoto T, Oliveira JT, et al. Full-length axon regeneration in the adult mouse optic nerve and partial recovery of simple visual behaviors. Proc Natl Acad Sci U S A. 2012 Jun 5. 109(23):9149-54. [Medline]. [Full Text]. Keirstead SA, Rasminsky M, Fukuda Y, Carter DA, Aguayo AJ, Vidal-Sanz M. Electrophysiologic responses in hamster superior colliculus evoked by regenerating retinal axons. Science. 1989 Oct 13. 246(4927):255-7. [Medline]. Fischer D, Heiduschka P, Thanos S. Lens-injury-stimulated axonal regeneration throughout the optic pathway of adult rats. Exp Neurol. 2001 Dec. 172(2):257-72. [Medline]. Albert DM, Jakobeic FA. Optic atrophy. Principles and Practice of Ophthalmology. 2nd ed. Philadelphia: WB Saunders; 2000. 4108- 4113. Anderson DR. Ascending and descending optic atrophy produced experimentally in squirrel monkeys. Am J Ophthalmol. 1973 Nov. 76(5):693-711. [Medline]. Glaser JS. Neuro-Ophthalmology. 2nd ed. Philadelphia: JB Lippincott; 1990. 115-117. Hoyt WF, Schlicke B, Eckelhoff RJ. Fundoscopic appearance of a nerve-fibre-bundle defect. Br J Ophthalmol. 1972 Aug. 56(8):577-83. [Medline]. Kline LB, Bajandas FJ. Neuro-ophthalmology Review Manual. 5th ed. New Jersey: Slack; 2004. 153-164. Kuppersmith MJ, Krohn D. Cupping of the optic disc with compressive lesions of the anterior visual pathway. Ann Ophthalmol. 1984. 16:948-953. Miller NR, Newman NJ. Walsh & Hoyt's Clinical Neuro-ophthalmology. 6th ed. Philadelphia: JB Lippincott; 208- 218. Miller NR, Newman SA. Transsynaptic degeneration. Arch Ophthalmol. 1981 Sep. 99(9):1654. [Medline]. Newman NJ. Optic disc pallor: a false localizing sign. Surv Ophthalmol. 1993 Jan-Feb. 37(4):273-82. [Medline]. Schwartz B. Cupping and pallor of the optic disc. Arch Ophthalmol. 1973 Apr. 89(4):272-7. [Medline]. Tasman W, Jaeger EA. Topical diagnosis of optic nerve lesions. Duane's Ophthalmology. Philadelphia: JB Lippincott; 2007. Thompson HS. Pupillary signs in the diagnosis of optic nerve disease. Trans Ophthalmol Soc U K. 1976 Sep. 96(3):377-81. [Medline]. Trobe JD, Glaser JS, Cassady J, et al. Nonglaucomatous excavation of the optic disc. Arch Ophthalmol. 1980 Jun. 98(6):1046-50. [Medline]. Trobe JD, Glaser JS, Cassady JC. Optic atrophy. Differential diagnosis by fundus observation alone. Arch Ophthalmol. 1980 Jun. 98(6):1040-5. [Medline]. Liao C, Ashley N, Diot A,et al. Dysregulated mitophagy and mitochondrial organization in optic atrophy due to OPA1 mutations. Neurology. 2017 Jan 10. 88 (2):131-142. [Medline]. [Full Text]. Boegel KH, Tyan AE, Iyer VR, Rykken JB, McKinney AM. Utility of coronal contrast-enhanced fat-suppressed FLAIR in the evaluation of optic neuropathy and atrophy. Eur J Radiol Open. 2017. 4:13-18. [Medline]. [Full Text]. Bourne SC, Townsend KN, Shyr C, Matthews A, Lear SA, Attariwala R, et al. Optic atrophy, cataracts, lipodystrophy/lipoatrophy, and peripheral neuropathy caused by a de novo OPA3 mutation. Cold Spring Harb Mol Case Stud. 2017 Jan. 3 (1):a001156. [Medline]. [Full Text]. Nonarteritic anterior ischemic optic neuropathy. Arteritic anterior ischemic optic neuropathy, cilioretinal artery occlusion. Juvenile open-angle glaucoma (JOAG) with optic pallor. Fast Five Quiz: Can You Recognize Kugelberg Welander Spinal Muscular Atrophy?